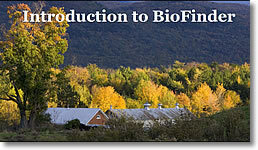 BioFinder is a database and mapping tool for identifying Vermont's lands and waters that support important ecosystems, natural communities, habitats, and species. It features Vermont Conservation Design and was developed by the Agency of Natural Resources and partners to support stewardship and conservation. BioFinder highlights networks of forests, streams and other features that together create the heart and backbone of Vermont's landscape. Explore these pages for a better understanding of how the map works. See the Map is the BioFinder Mapping Tool. Interpreting Results gives you guidance for getting the most out of your research. Mapping Vermont’s Natural Heritage is a guide that describes the datasets used on BioFinder, interprets them, and lists possible strategies for conserving them. The Community Wildlife Program of the Vermont Fish & Wildlife Department provides technical assistance and support for professional and lay planners in Vermont. CWP helps regional and municipal planning commissions and non-governmental organizations in their efforts to protect wildlife habitat and significant natural communities. For more information, go to Vermont Fish & Wildlife Dept. Community Wildlife Program, or contact Jens Hilke, jens.hilke@vermont.gov.